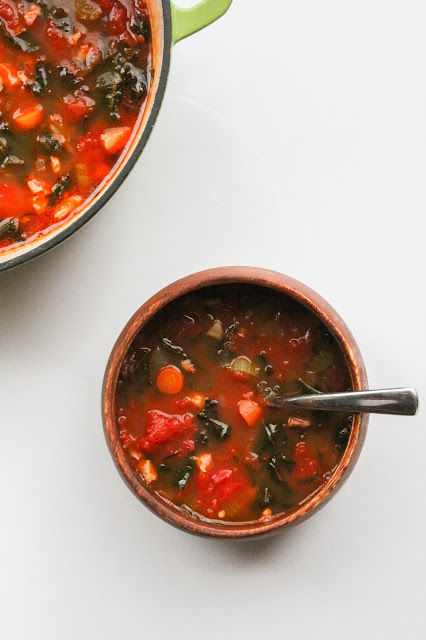 soup is homemade comfort food at its best! I love soup, especially during the winter. There isn't anything quite as comforting as a big bowl of hot soup on a cold day. We've had plenty of those cold days lately, so there have been many pots of soup on my stove. Homemade soup is easy to make and most recipes can be ready quickly, so it's a great choice for busy weeknights. 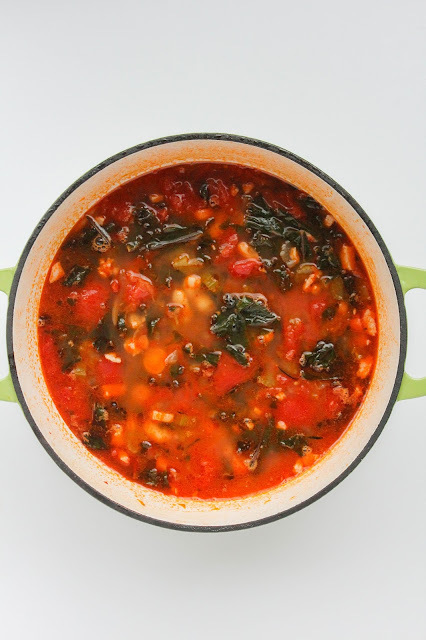 This super flavorful minestrone is packed with fresh veggies, canned tomatoes, crispy pancetta, and herbs. Pair it with your favorite grilled cheese sandwich for an easy dinner that the whole family will love, especially the kids! You may remember that last year I had the wonderful opportunity to go on a Red Gold Tomatoes Family Farm Tour in Indiana. Since I use Red Gold products often in my cooking, I was thrilled to get to see the behind the scenes action! During the trip I visited their their headquarters, a tomato farm, and two of their processing plants, and learned so much about how the tomatoes go from farm to can. I also learned that Red Gold Tomatoes are now non-GMO verified, and their cans have non-BPA/BPS liners. They are also gluten free, and have no artificial flavors or colors. One of the activities we participated in at the Headquarters was a tomato cutting and tasting. 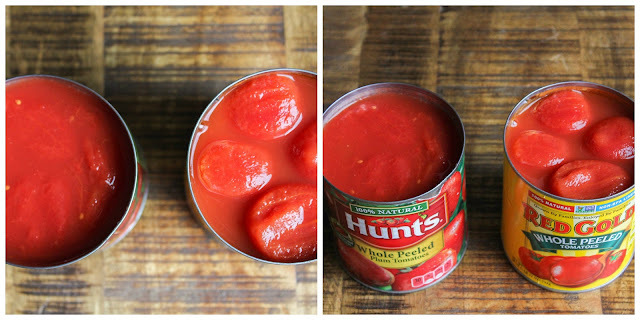 We compared Red Gold tomatoes with other brands of canned tomatoes, and looked at things like their color, size, and flavor. Red Gold recently sent me my own product cutting kit so that I could do my own comparison at home. The first thing I noticed as soon as I opened the cans was that I could see the Red Gold Tomatoes immediately. Not just juice, the tomatoes could visibly be seen. When I poured them into dishes, I noticed that the Red Gold Tomatoes were smooth and whole. The other brand was a bit mushy, and some of the tomatoes were broken up. The Red Gold Tomatoes were also a beautiful red color. When I cut the tomatoes in half, the Red Gold Tomatoes held their shape, whereas the other brand seemed to fall apart. When I tasted them, the Red Gold had a distinct fresh tomato flavor, while the other brand tasted a bit metallic. 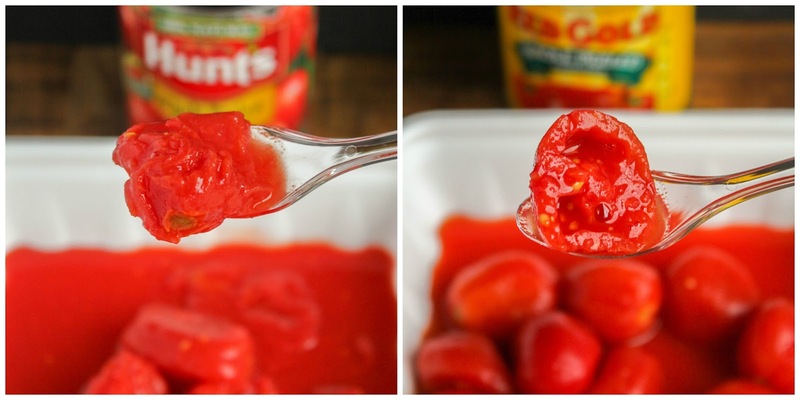 I would have never thought before that canned tomatoes could be so different, but now I know for sure there is a difference. Experiencing the product cutting and tasting at the Red Gold Headquarters, and again at home, was an eye opening experience. 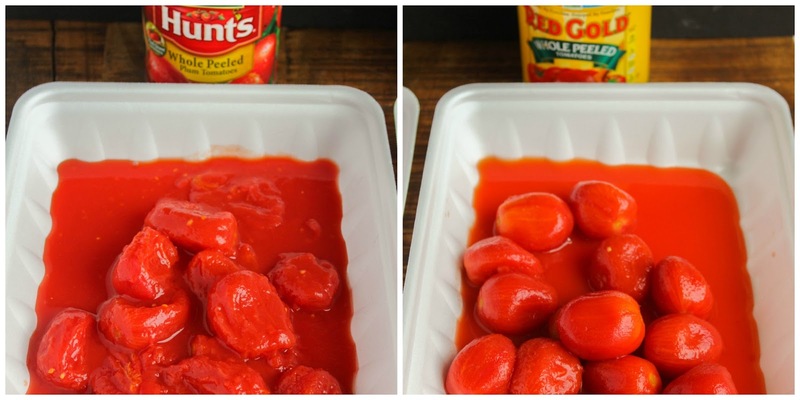 This explains why I've always loved Red Gold Tomatoes so much! They really do have the best flavor and I love cooking with them and adding them to my dishes. 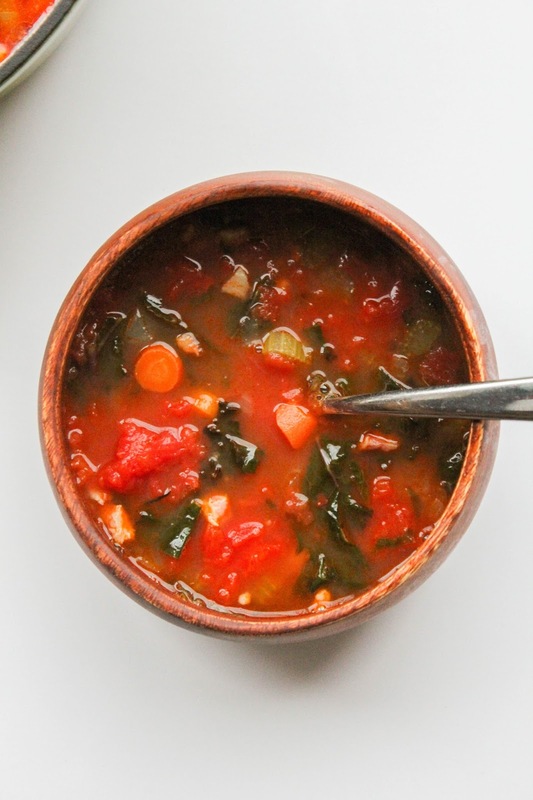 This minestrone calls for Red Gold whole peeled tomatoes which add a depth of flavor to the soup. The tomatoes combined with all of the fresh vegetables and herbs make it so fresh. The best part is, the soup just gets better the longer it sits. So if you don't finish it right away, no worries! Tomorrow it will taste great, and the next day it will be even better. Now, who's ready to make some soup? Heat the oil in a Dutch oven or large pot over medium-high heat. Add the pancetta and cook, stirring often, until brown and crispy. Add the onion, carrots, celery, garlic, red pepper flakes, and a sprinkle of salt. Cook until the vegetables are tender, stirring often, about 10 minutes. Add the tomato paste and stir to coat the vegetables. Add the tomatoes, crushing them with a wooden spoon in the pot. Add the Parmesan rind, if using, and the rosemary and bay leaves. Add the water and chicken broth, season with salt and pepper, and bring to a boil. Reduce the heat to simmer, cover the pot and cook until the flavors have melded, about 20 minutes. Add the beans and kale and cook until the kale is tender and the beans are warmed through, about 5 minutes. Remove the Parmesan rind and herbs before ladling the soup into bowls. I am proud to be a Red Gold® Brand Ambassador and thank them for sponsoring this post!